Our goal at Powder Valley Poodles is to provide the healthiest, most temperamentally sound and conformationally correct dogs possible. In doing so we create long-lived, happy and beautiful pets and working dogs. Many people are unaware of the type of work our dogs perform. This page is intended to provide an overview of the services working poodles can provide. The answer is: Not much. After very careful selection of parent dogs, years of genetic screening and socialization practices, there isn’t much difference in temperament between our puppies selected to go into the working programs and those chosen to be sold as pets. The genetics are the same and the socialization practices are employed on all of our puppies. Almost any puppy from our litters can go into a working situation. They are, for the most part, all bright, all healthy, and all easy to train with great temperaments. Frequently, the only reason one puppy is chosen over another has to do with something as insignificant as size, color, or gender. Our puppies grow up to be great dogs, and with the right training they can also be great partners at work. A service dog as defined by the Americans with Disabilities Act is (paraphrased) any dog that has been trained to do a specific task in order to help its disabled owner live a more normal life. Guiding the blind, pulling a wheel chair, retrieving a dropped object to hand and alerting to oncoming seizures are all common tasks performed by service dogs. They are allowed by federal law to accompany their handler anywhere; into restaurants, movie theaters or grocery stores. Access is required by law. PVP’s “Rockie” is a seizure-detecting dog. He is able to alert his owner when one of her seizures is coming. A therapy dog is not a service dog. A therapy dog can not accompany a handler into areas off limits to dogs. However, they are still working dogs. Therapy dogs are dogs with special training and very tolerant personalities. They like people but are well-behaved in their presence. They are taken by owner-volunteers to visit hospitals, hospice facilities, rehab and assisted living facilities. Professional therapists will also use dogs in individualized treatment plans. Many people have an easier time with therapy when a dog is in the room or in their lap. Children, especially, may be coaxed into talking to a dog when talking to an adult may be too intimidating. Until recently, a social facilitator dog was considered a service dog. However, changes in federal law have eliminated this type of job description from the laws protecting service dog access. In other words, if a restaurant, movie theater, grocery store or business owner objects to the social facilitator dog then it must leave. Access is not guaranteed. A social facilitator dog is a dog that accompanies an individual in order to give that individual moral support, companionship, and to act as a buffer against strangers. Other than basic obedience training the dog does not have specialized training. The owner may or may not be considered disabled. A good example of social facilitating dogs are dogs given to children with developmental disabilities. The dogs may accompany the children many places but they are not covered by the same laws covering service dogs. 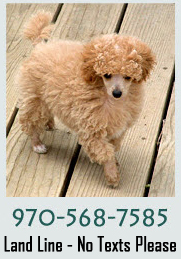 Powder Valley Poodles and Rocky Mountain Rawhide takes great pride in the number of puppies chosen from our breeding program to become service, therapy, and social facilitator dogs. They are working dogs that are part of the family, but with responsibilities going beyond that of simply being a great pet. We believe all dogs do best with a job, whether it is fetching slippers, listening to children read or pulling a wheelchair. Our Powder Valley Poodles dogs like to work, and they love their people.